It’s going to be the biggest day of your life. You have the man of your dreams and the dress of a lifetime. Everything is perfect… Your hair is your crowning glory, so if you want make the ultimate impression; let BAROQUE take care of you. Experienced in all types of wedding hair and bridal magazine styling, Tom and his team will help prepare you for your wedding with special treatments and cuts in advance to ensure your hair is in optimum condition. On the big day, you and your wedding party are invited to our exclusive top floor VIP room so you can relax and be pampered with champagne and canapés while we take care of your styling. A 30 minute informal appointment where we get to know you and your aspirations for the big day, right through to the fine details of shoes, jewellery and makeup. Based on our discussions we propose various styles and work with you to select a final one. At this point we give you an estimate and recommend that you book your wedding and dress rehearsal appointments which are secured with a non-returnable deposit of £165 that will be redeemed against the final amount. A dress rehearsal is imperative if everything is to go faultlessly on the day. Working with you, we translate ideas from your consultation into tangible results. Step by step we take you through the hairstyle considering every aspect in terms of height, movement, smoothness and finish ensuring you are 100% happy with the result. Bring your pearls, tiara, flowers, sparkles or veil and we’ll work to incorporate whatever you’ve chosen into the total effect. With a clear picture of what we want to achieve, we give you a tailor-made quotation based on your specific needs and, if you choose, those of your bridesmaids and other members of the wedding party. So you can get ready at a relaxed and leisurely pace, we usually like to welcome you early to our exclusive VIP room. It’s a place of calm, where nerves settle, as our skilled team take time to pamper you so you can sit back, unwind with bubbles and canapés while we dress your hair to perfection. 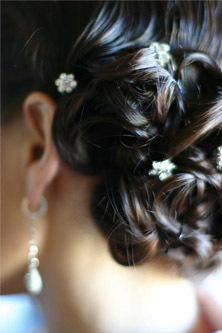 Remember to bring everything with you: tiara, veil, flowers, sparkles… and don’t forget to wear a button shirt. Many brides are happy for the bridesmaids and others to have what they feel is ‘in keeping’ in terms of hairstyle, with the theme carried through in their dresses, shoes or head pieces if chosen. Your wedding party requirements will be discussed at the dress rehearsal and your quotation will be tailored accordingly.